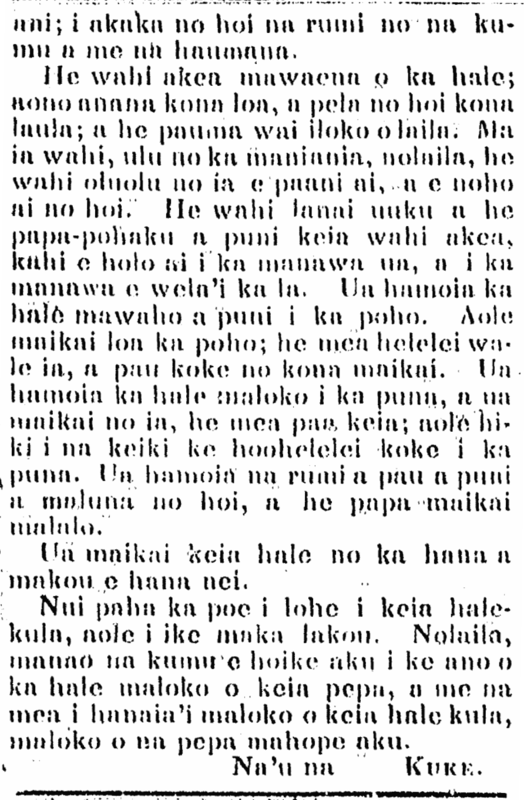 Memorial tablets in honor of John Papa Ii, Timoteo Haalilio, Levi Haalelea, and Ululani Haalelea, 1907. Dedicatory Services at Old Church Yesterday Morning. Old Kawaiahao church yesterday morning was crowded for the dedication of memorial tablets in honor of John Ii, Haalilio, Haalelea and Ululani, one tablet bearing the name of Ii and the other the three latter names. Old days were recalled as eloquent speakers spoke of the good works of the aliis who have passed away and in whose honor marble tablets have been inscribed. The Rev. S. L. Desha officiated at the dedication of the Ioane Ii tablet and also spoke concerning Timoteo Haalilio, while the Hon. 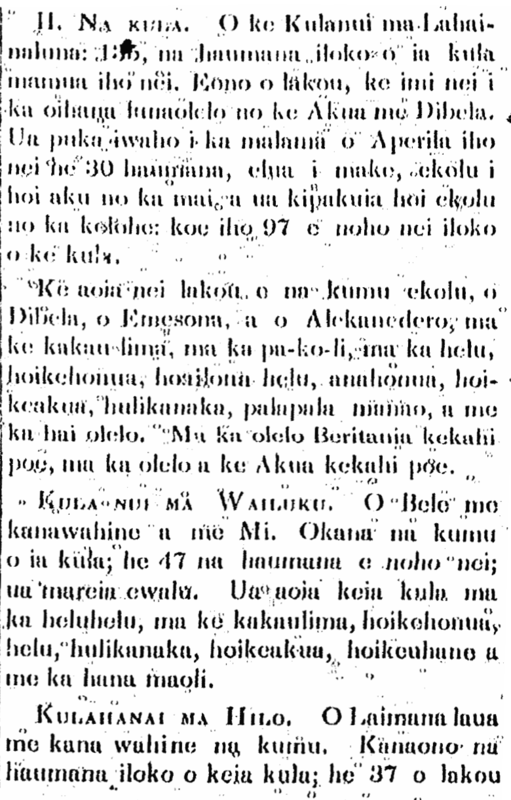 E. K. Lilikalani delivered the dedicatory as far as it concerned the memory of Levi and Ululani Haalelea. The Rev. H. H. Parker was present and introduced the speakers with appropriate remarks. The Rev. S. L. Desha referred to Ii as one of the high chieffs of the islands who had enjoyed the confidence of royalty, who was a member of Kawaiahao church when Bingham was pastor. He was a member of the Supreme Court and a member of the land commission under Kamehameha III and Kamehameha IV. Not was he only powerful for good in the work of the church, but he had always been noted as a man of great physical strength. One day a young prince had been thrown by an ill-tempered horse and Ii, to revenge royalty, killed the animal with one blow of his fist. Speaking of Haalilio, Desha stated that this alii was born in Koolau, this island, of most distinguished parents, his mother having been Governor of Molokai. When he was eight years of age his father died and King Kamehameha III took him to court and when Mr. and Mrs. Cooke built the school for the royal princes, Haalilio went there to be educated. He graduated with honors, becoming a particularly good speaker of English. Hon. Lilikalani, indicating the tablet upon which were the names of Haalelea and his wife, declared that it belonged to no one person, but to all the church for each and all had contributed to the expense. The Pacific Commercial Advertiser, Volume XLVI, Number 7857, Page 1. October 14, 1907. Hilo, July 22, 1842, and at the age of 16, in 1858, married Haalelea, related to the queen of Kamehameha III and to King Lunalilo. The husband died in 1864. There was no issue. In that year H. H. Parker came to Honolulu from Lahainaluna where he had been a teacher, to take the pastorate of Kawaiahao church. Then Mrs. Haalelea joined the church and for 40 years was an active and beloved member of the congregation. She was noted for her humble bearing and good Christian works. She was active among benefit societies for the Hawaiians and others and was a vice president of the Hui Hoola Lahui and an honorary member of the board of trustees of the Kapiolani Maternity Home. She was also one of the presidents of the Hui No Ea. In 1893 it was decided that the Kawaiahao church was a dangerous place to enter on account of the rottenness of the roof and other timbers. They were troublous times then, the dethronement of Liliuokalani being the tais and one man’s hand turned against another, said Lilikalani, and it was not thought that any money could be raised for repairs, but Mrs. Haalelea got up a church fair that realized $2000 and this money was the beginning of a fund that finally, with the help of prominent and generous Honolulu people, resulted in the repair of the sacred edifice. On this account Lilikalani referred to Mrs. Haalelea as the second founder of Kawaiahao. The Pacific Commercial Advertiser, Volume XLVI, Number 7857, Page 4. October 14, 1907. 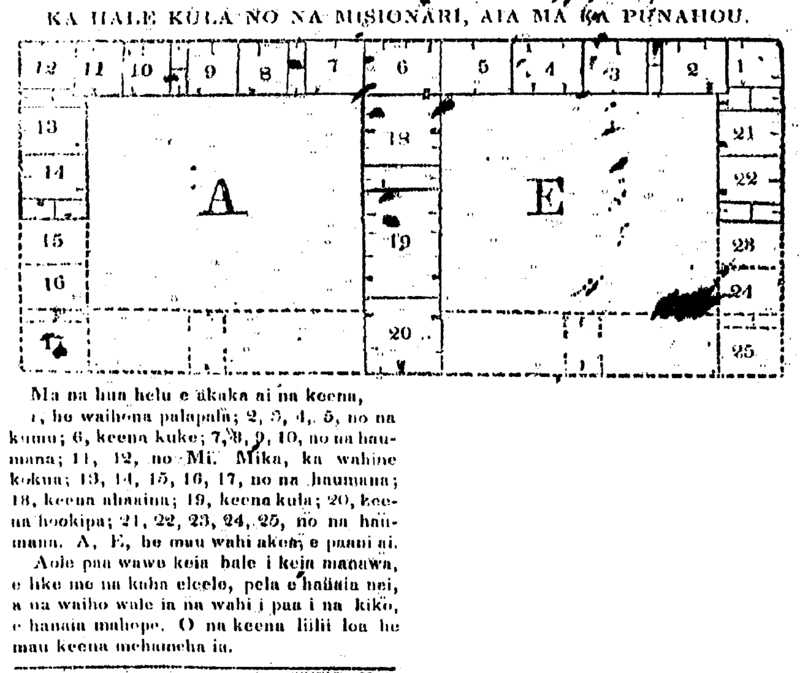 The beginnings of Punahou School, 1841. SCHOOLHOUSE FOR THE MISSIONARIES, AT KA PUNAHOU. 1, a library; 2, 3, 4, 5, for the teachers; 6, kitchen; 7, 8, 9, 10, for the students; 11, 12, for Mi. Mika [?] the woman helper; 13, 14, 15, 16, 17, for the students; 18, cafeteria; 19, school room; 20, room for entertaining guests; 21, 22, 23, 24, 25 for the students. A, E, wide areas to play. This will not be completed quickly at this time; the places with solid lines are being constructed, and the areas surrounded by dashes are left to complete at a later date. The most tiny rooms are solitary rooms. 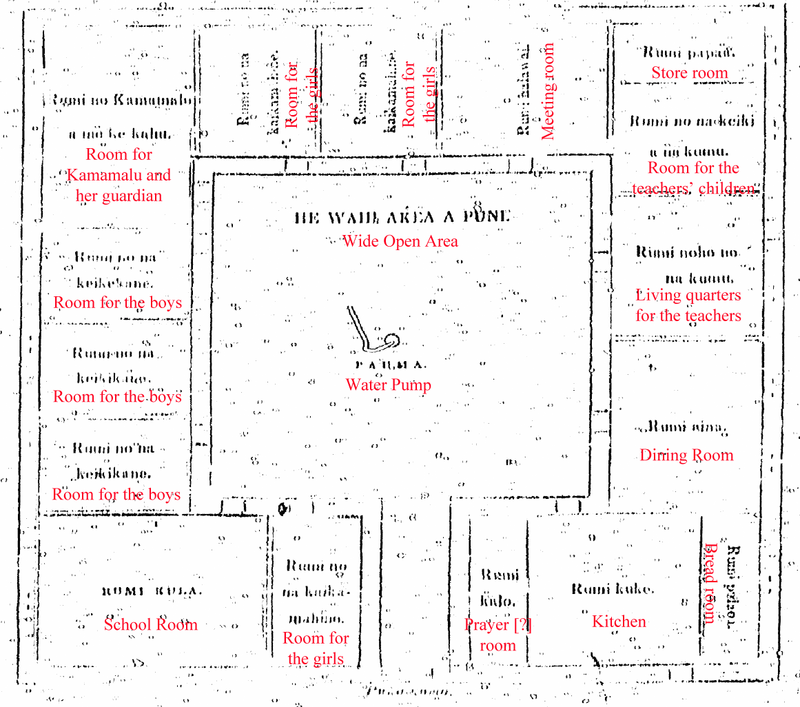 [Earlier, i posted a diagram of the layout of the Chiefs’ Children’s School. Here from about the same time is the school for missionary children at Kapunahou, the precursor to today’s Punahou School. Ka Nonanona, Buke 1, Pepa 11, Aoao 44. Novemaba 23, 1841.